“The powers of financial capitalism had another far reaching aim, nothing less than to create a world system of financial control in private hands able to dominate the political system of each country and the economy of the world as a whole. This system was to be controlled in a feudalistic fashion by the central banks of the world acting in concert, by secret agreements, arrived at in frequent private meetings and conferences. The apex of the system was the Bank for International Settlements in Basle, Switzerland, a private bank owned and controlled by the worlds’ central banks which were themselves private corporations. The era of private banking influence, as symbolized by the BIS, was also restored, but within a new framework which also incorporated the public institutions of the International Monetary Fund and the World Bank. The U.S. is quickly becoming known as the new Switzerland of international banking, due to its refusal to sign onto the new global disclosure standards, issued by the Organization for Economic Co-operation and Development (OECD), a government-funded international policy group. “Money is Power”, or shall we say, “The Monopoly to Create Credit Money and charge interest is Absolute Power”. (Alex James) Amsel (Amschel) Bauer Mayer Rothschild, 1838: “Let me issue and control a Nation’s money and I care not who makes its laws”. “World events are staged and managed by those who hold the purse strings,” said former UK Defence Minister Dennis Healey. The Rothschild Syndicate’s backing of Hitler is a prime example. In the depth of the Depression, the Nazi Party’s appeal to many Germans was food, a clean uniform and a gun. The Nazi paramilitary SA (Sturmabteilung ) grew from 400,000 men in 1930 to over three million by the end of 1933. The cost of supporting all these people was steep. If a suppressed 75-page booklet, Hitler’s Secret Backers,(1933) is correct, the check was picked up by the Rothschilds. Their only stipulation was that Hitler adopt “an aggressive” foreign policy. The Illuminati instigate endless war to destroy, degrade and subjugate humanity. They encumber nations with “debt” incurred to buy their armaments, and consolidate power with wartime measures which become permanent. Finally, as Luciferians, they serve their god by sowing chaos and destroying life. Specifically, WW2 killed roughly 50 million European Christians, wiping out the cream of another generation. It also provided a justification for the establishment of the State of Israel, world HQ of the satanist Illuminati. Hitler’s Secret Backers was written by a “Sidney Warburg,” son of banker Paul Warburg, the founder of the US Federal Reserve and a Director of the Council on Foreign Relations. He describes three missions to Hitler in 1929, 1931 and 1933 to arrange payments of $10 million, $15 million and $7 million respectively. The problem is that Warburg’s son was not Sidney but James Warburg, who later disavowed authorship of the book. We believe it was a youthful indiscretion. The Powers That Be try to dismiss this book as another anti-Semitic hoax. However the book is not anti-Semitic. The Rothschilds are not mentioned once. 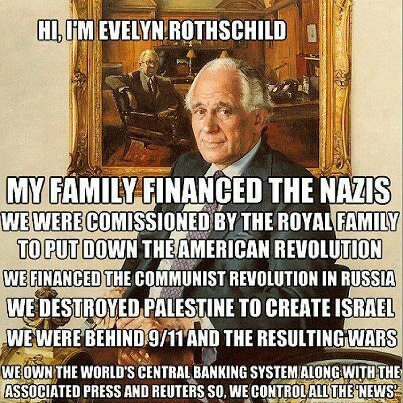 The New York financiers –Rothschild frontmen–are depicted as non-Jews. Sydney Warburg describes his first meeting in July 1929 with a “Carter” (John Ridgley Carter) the president of JP Morgan’s Guarantee Trust, “the young Rockefeller” (John Davison Rockefeller Junior) and “Glean from Royal Dutch” (i.e. Henri Deterding). There is no doubt in my mind that the Rothschilds were responsible for the holocaust. The Rockefellers are scions of the old corrupt, criminal, nasty, and ultimately suppressed Dutch East India Company, like the Roosevelts and Vanderbilts. The Dutch East India Company was far larger and more powerful than the British Crown and one day in the early 1700’s, it simply disappeared. Where did the largest merchant transport fleet in the world go? The monster octopus has so many tentacles. But of all these sucking arms, nothing is more secretive than the Central Bank of all central banks, the BIS that is nestled in a country with a Red Cross flag to represent it. Few understand how to value gold, and even fewer understand that gold is not really an investment — it is money. Of course, if you want a portfolio that preserves wealth, money is a good place to start. Billion dollar lawsuits are nothing to gold-rigging banks like Deutsche, but the proposition of spending time in jail might just have motivated the notorious criminal institution’s executives to rat on its peers. This is just the beginning of disclosure in the financial industry which the world has never before seen. Deutsche was fined just over $2.5 billion barely a year ago for rigging interest rates, and now they are admitting in settled U.S. lawsuits this week that they manipulation gold and silver prices on international markets. Part of the settlement involved the naming of co-conspirators in the manipulation of these markets. The scam is being called ‘the London Gold Fix’, and in addition to Deutsche Bank, Canada’s Bank of Nova Scotia, the U.K.’s Barclays and HSBC, and France’s Société Générale are involved. More than likely hundreds of banks participated in illegally setting prices for gold and silver – but this isn’t really news to those familiar with the ministrations of the elite banking cabal. Cushy banking jobs are only given to those deemed worthy by the ‘Four Horsemen’ of banking who are among the top ten stock holders of practically every Fortune 500 company and who come from only eight families. According to Global Finance magazine the world’s five biggest banks are all based in Rothschild fiefdoms in the UK and France, though Chinese banks are gaining power. In the US, a combination of deregulation and merger-mania has left four mega-banks ruling the financial world: Bank of America ($2.2 trillion), JP Morgan Chase ($2 trillion), Citigroup ($1.9 trillion) and Wells Fargo ($1.25 trillion). That’s your four. So, any gold rigging, libor scandal, price fixing, mortgage rate ridiculousness, etc. is going to trickle down from these banking elite. John Merrill, founder of Merrill Lynch, exited the stock market in 1928, as did insiders at Lehman Brothers, but merger mania left us with just a handful of conspirators that could control entire markets – including the lucrative gold and silver markets. Is it any real surprise, then, that the first class action alleges that the defendants, including The Bank of Nova Scotia, conspired to manipulate prices in the silver market under the guise of the benchmark fixing process, known as the London Silver Fixing, for a fifteen-year period? Or that an identical class action suit was filed for manipulating gold prices? Or that plaintiffs accuse Deutsche Bank of conspiring with Bank of Nova Scotia (BNS.TO), Barclays Plc (BARC.L), HSBC Holdings Plc (HSBA.L) and Societe Generale (SOGN.PA) to manipulate prices of gold, gold futures and options, and gold derivatives through twice-a-day meetings to set the so-called London Gold Fixing. Old news – but of course the corporate, bank owned media is just now setting us all straight. As Preston James and Mike Harris explain, “the history of the Khazarians, specifically the Khazarian Mafia (KM), the World’s largest Organized Crime Syndicate that the Khazarian oligarchy morphed into by their deployment of Babylonian Money-Magick, has been nearly completely excised from the history books.” They are talking about this rank and file banking cartel. The full history of this perpetuating fraud can be perused, here. This article (Global Bankster Mafia Caught Rigging Markets to Destroy Middle Class) was originally created and published by Waking Times and is published here under a Creative Commons license with attribution to Christina Sarich and WakingTimes.com. It may be re-posted freely with proper attribution, author bio, and this copyright statement. Unless we go back to the underlying causes [of the 2008 crash] we will never understand what happened and will be unable to prevent a repetition and help our economies truly recover. The world economy today seems incapable of restoring the prosperity we took for granted before the crisis. Further turbulence in the world economy, and quite possibly another crisis, are to be expected. William White, chairman of the Economic and Development Review Committee at the OECD and former chief economist at the Bank for International Settlements (BIS), says the risks posed by global debt levels are greater today than they were in 2007 and that central banking monetary policy has lost its effectiveness. He also explains the crucial differences between modern macroeconomic modeling and complexity theory (or viewing the economy as a complex adaptive system) and the key lessons this has for policymakers, both fiscal and monetary. Harley Schlanger from LaRouchePAC joins me for an economic and geopolitical update. Harley warns that negative interest rates is a banking term for theft, and Harley warns “If they start letting the banks steal deposits, what you are looking at is a chain reaction collapse that will wipe everyone out.” But Harley also believes that the Bankster Oligarchs are ripe for a fall, but it will require AMERICAN PATRIOTS to rise up and TAKE them down. We also discuss the 2016 Presidential race which will leave us with the Communist NWO agenda of Hillary Clinton if people allow it. Standing in stark opposition to the Bush-Clinton crime families is Donald Trump. We discuss it. Please notice the amount of credit being used to carry stocks now is significantly larger than it was at previous market tops in 2000 and 2007. Also, the amount of credit has begun to contract, this is a classic margin call being met …so far. The danger of course is as it always has been when margin builds like this. As the equity market pulls back, margin calls are issued and in some cases “forced sales” are done. This can, has in the past and most likely will occur and morph into a virtual loop where forced sales weaken prices, creating new margin calls and more forced sales in a negative feedback loop…otherwise known as a market panic. It does need to be pointed out, there will be no “white knight” this time around as there are none left. This brief article will explain why the world’s banking system is unsound and what differentiates a sound from an unsound bank. I suspect not one person in 1,000 actually understands the difference. As a result, the world’s economy is now based upon unsound banks dealing in unsound currencies. Both have degenerated considerably from their origins. Armstrong Economics: Martin Arthur Armstrong (born November 1, 1949 in New Jersey) is the former chairman of Princeton Economics International Ltd. He is best known for his economic predictions based on the Economic Confidence Model, which he developed. Iceland just sentenced their 26th banker to prison for his part in the 2008 economic collapse. However, we believe that given the chance, everyone would succumb to greed and power. The system itself is what needs to be addressed and urgent measures taken. The case of Rodrigo Rato is perhaps the most interesting among some 150 high-level corruption cases scheduled to take place this year in Spain – involving over 2,000 elite figures in Spanish society. Rato was the country’s Minister of Economics from 1996 to 2004, and a leading political force in the conservative Popular Party (PP) as well as managing director of the IMF (2004-2007) and chairman of Bankia, Spain’s largest bank (2010-12). 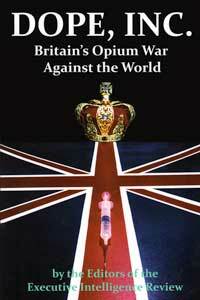 The Crown’s Rage Against LaRouche – Since no later than the 1978 publication of the first edition of Dope, Inc., the British royal family and its entire intelligence and courtier apparatus has been on a rampage against Lyndon LaRouche, the founder and contributing editor of EIR, and the man who commissioned the Dope, Inc. dossier in the first place. I phone them. They say they cant give me a court order or it sounded like they dont have one. They said they can only give me certificate detailing amount being owed. Told them that the certificate i dont need. I gave them your email address to send papers to. How do i stop these lawyers now from sending me these daily treath messages? By the way i think i must clarify this matter. This matter is not about a car, my car was repossessed about 18 months ago. The debt is for a shortfall created when they auctioned my car. Over R150.000. I am going to loose all my household goods in the house when they come. I did send a cease & deseast letter to the bank more than a year ago but obviously they ignore my letters as usuall. Hi once again BT. More than a year ago i sent MFC a cease & decease letter as they were attempting to collect a debt on my car that they repossssed & auctioned. They kept quiet. Today i received this sms. How do i deal with this issue now, what do i d if they arrive on my doorstep for a visit, do i respond to this sms? On a point of law, to the best of your knowledge, is there a statute of limitations on fraudulent concealment? I understand that there is not. If that is the case, then we can go back 100 years???? Another question, who owns the government land? The government, being a registered corporation cannot own anything…. Am I right? They have shareholders; which is not the people. Most shareholders are investors; foreign investors. Common Law Maxims: The inclusion of one is the exclusion of another. The certain designation of one person is an absolute exclusion of all others. 11 Coke, 58b. „expressio unius est exclusio alterius” – A maxim of statutory interpretation meaning the expression of one thing is the exclusion of another. So the true sense of the word, the definition is similar to this: The „Republic” means the company „Republic of South Africa” which is limited to the „territorial sea” (wherever that may be) as well as areas outside of this sea (non-specific) which South Africa (note not the „republic”) can exercise sovereign jurisdiction with regards to the „exploration and exploitation of natural resources” (an inclusion which like an exclusion, excludes everything else). Blikskottel…loves to see legal maxims and statutes explained. I always get letter offers from Nedbank to loan me money up to R200.000. I am tempeted to take the loan. Atleast R50.000 How do i approach this loan without getting into a contract of consenting to repayments & having to write letters to the bank requesting proof of debt? now that we are educated as to the fraudulent nature of banking would we still consider it moral and ethical to further participate in the fraud? Especially, when we know that it is bankrupting our nation and hope of a better future? Is it not our sacred duty to rather stop feeding the beast? Should we not be looking for remedy and spending energy on building new models that make the existing ones obsolete?